I appreciated the candidness with which economist Ross Garnaut introduced and concluded his recently released update on the science of climate change, one of a series of updates to his 2008 Review which have been commissioned by the Australian government. In the introduction he explains how he began his original Review with no strong views and no more than a common knowledge of climate change science. He read a fair bit of climate science in the course of preparing the Review, including paying due attention to sceptics with genuine scientific credentials, and his investigations led him to the premise for his Review that ’on a balance of probabilities’ the central conclusions of the mainstream science were correct. Since then he has moved in his thinking to regard it as highly probable that most of the global warming since the mid-20th century is human-caused. Further, he declares that he would now be tempted to say that those who think that temperatures and damage from a specified level of emissions over time will be larger than is suggested by the mainstream science are much more likely to be proven correct than those who think the opposite. That personal view is illuminated but not expressed in the excellent survey which follows. It is an account, fully accessible to the lay reader, of where mainstream climate science stands at the present time. Its references include many papers published within the last couple of years. The main points have already been posted by Gareth and I’ll simply pick out one aspect before moving to Garnaut’s conclusion. He discusses the appropriateness of the 2 degree rise in temperature widely accepted as the boundary beyond which climate change becomes dangerous, noting that since the Review there has been more comment in the mainstream science that a 2 degree target may be insufficient to avoid ‘dangerous climate change’. He refers to the recent Anderson and Bows paper suggesting that, based on updates to the science, 2 degrees could now be considered as a threshold between ‘dangerous climate change’ and ‘extremely dangerous climate change’. Hansen’s 2008 proposal that 350 ppm carbon dioxide is the safe boundary receives mention, along with a supporting 2009 paper from Rockstrom. Although currently not likely to figure in policy action it ’sits there as a warning of danger’. However at current rates of emissions the global budget for an objective of 2 degrees will have been exhausted within a couple of decades. Indeed Garnaut considers it is now necessary to explore the implications of a global temperature rise of 4 degrees above pre-industrial, well beyond the experience of human civilisation. The risks accompanying a 4 degree rise are considerable. There would be an 85 per cent probability of initiating large-scale melt of the Greenland ice sheet. 48 per cent of species would be at risk of extinction. 90 per cent of coral reefs would be above critical limits for bleaching. Accelerated disintegration of the west Antarctic ice sheet and changes to the variability of the El NiÃ±o — Southern Oscillation would be triggered. Terrestrial sinks such as the Amazon Rainforest would be endangered, becoming sources of carbon rather than sinks. Severe weather events would intensify. Immense changes in the capacity of parts of the earth’s surface to support substantial populations would place great strain on national and global political systems. He notes that recent science suggests that severe and catastrophic climate change outcomes may be triggered at lower temperatures than previously thought, further increasing the risks of catastrophic outcomes in a 4 degrees warmer world. In the conclusion Garnaut highlights what has been apparent throughout his survey, that the science he accepted ’on the balance of probabilities’ for his Review has only grown stronger in the subsequent three years, and so far as his own personal intellectual journey is concerned it is now closer to the more stringent criminal law requirement of ’beyond reasonable doubt’. The most important and straightforward of the quantitatively testable propositions from the mainstream science have been confirmed or shown to be understated by the passing of time: the upward trend in average temperatures; the rate of increase in sea level. The science’s forecast of greater frequency of some extreme events and greater intensity of a wider range of extreme events is ’looking uncomfortably robust’. Some measurable changes are pointing to more rapid movement towards climate ’tipping points’ than suggested by the mid-points of the mainstream science. He instances the rate of reduction in Arctic sea ice and the emergence of accumulations of methane in the atmosphere at a rate in excess of expectations. He acknowledges that 450 ppm has now become a difficult target, given the slow progress on mitigation in the developed countries, but nevertheless counsels that it would be wise for Australians through their domestic actions and international interactions to work towards achieving that much. Along the way, he suggests, they can assess whether developments in knowledge have made the case that their national interest requires higher ambition. In a final reflection he dwells on the fact that his update has shown that new observations and results of new research have all either confirmed established scientific wisdom, or shifted the established wisdom in the direction of greater concern. This pattern has been present for some time in the development of climate science. He wonders whether the reason for this may be professional reticence to step too far ahead of received wisdom in one stride, and draws attention to Hansen’s remarks in Storms of my Grandchildren on how scientific reticence may in some cases hinder communication with the public. Garnaut himself in his own field has had experience in the past of writing and speaking about what the 1978 reforms in China might mean for the Australian economy in terms which were criticised as implausible but which turned out to be understatements, and has wondered whether he was influenced into understatement by repeated criticisms of optimism. Has something similar been at work for climate scientists? And is understatement making it difficult for the full risks of climate change to be appreciated by the lay public, himself included? He notes how in the published scholarly literature scientific sceptics are making fewer and weaker claims as the mainstream science moves away from them. At the other end of the spectrum, the scholars who were away from the mainstream in the other direction have found the mainstream science moving towards them. They have tended to remain more active in genuine scientific research and publication. He draws the reluctant conclusion that there must be a possibility that scholarly reticence, extended by publications lags, has led to understatement of the risks. Although he doesn’t advocate clutching for knowledge outside the mainstream wisdom he speaks of the need to be alert to the possibility that reputable science will in future suggest the need for much stronger and much more urgent action on climate change even than is warranted from today’s peer-reviewed published literature. One presumes he would be willing in such case to urge such action, no matter how difficult it might seem economically. 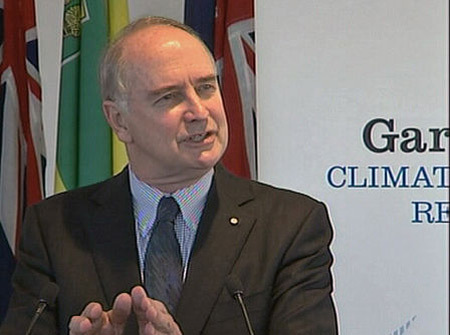 Garnaut’s update shows him observant and respectful of the science of climate change. It’s no more than one might reasonably expect of intelligent and well educated lay people, and it’s a sad commentary on our intellectual life that it occasions remark. It’s an essential credential for a policy adviser and one wishes it were more widely apparent among economists. Garnaut is like Nicholas Stern in respect to the science. Coincidentally the Wonk Room is carrying a recent interview with Stern (in three parts here, and here, with one to come) in which he too refers to the growth in scientific understanding since the Stern Review was published in 2006 and states that his report underestimated the risks now apparent. He briefly describes some of them and sombrely speaks of the risk of global war over the next century ’because you’ve got hundreds of millions of people, perhaps billions of people moving’. Needless to say he continues to urge action now in an industrial revolution which will bring emissions down rapidly over the next forty years at a reasonable cost for a massive risk reduction.